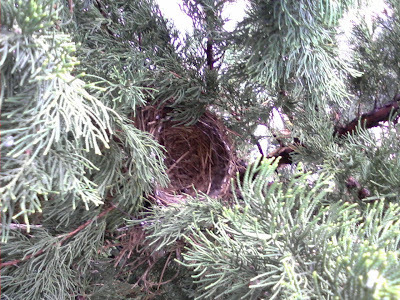 I checked in on the mean robins this morning and lo and behold, they've moved out! And just yesterday there were four chicks in the nest, and I was viciously attacked twice just for walking outside my front door. I saw two smallish robins hanging around the general area. It seems pretty likely these are two of the babies, though they looked a little bigger than I would have expected for only one day after being told it was time to get a job. Mommy was nowhere to be found. According to this site it only takes about two weeks from the time the eggs hatch until the young "fledge," or leave the nest. Then the father supposedly takes a couple weeks to teach them to take care of themselves. I have not seen this father around. He sounds like a deadbeat. I'll be keeping tabs on the newly fledged birds and see if I need to call child protection services.